Wow, this is pretty cool. I love the first step in defragmenting the comments across the web. Please continue. awesome feature. it pisses me off that i feel like i'm missing part of the conversation (since i basically ignore friendfeed and never check it). great leadership on getting comments back to the publisher! Great tool ! the only thing that is missing is different language settings. 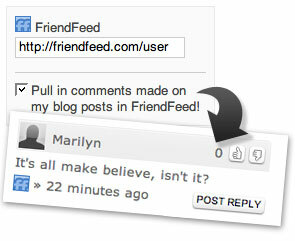 I forgot to mention, there is a 5 minute delay in the comment retrieval from FriendFeed. Thanks Rob. We'll keep on cranking. That's for letting us know. We're looking into this now. Great job guys! One thing I've noticed is that the FriendFeed comments are coming through email, but they are not showing up on my blog yet. Is there a (initial) delay? I got about 50 or 60 emails once I enabled the setting. Awesome job guys, this is welcome news for many. Well done! Awesome feature. will be a lifesaver for see and using it in blogger. Thanks for the feedback. Profile integration is definitely on the list. Could you elaborate on separating the 2 discussions? I'd like to get a better idea of what you have in mind. Thanks again fellas. From what I've seen, the FF comments are kinda just slipped in with the comments from the blog. Is it possible to separate the 2 discussions? Thanks for all these great features guys. I haven't been receiving email notification for some comments and received notification for a comment made yesterday. One more request, which I'm sure you're working on: have ID-FF integration recognize my ID profile on the blog. this is a cool feature. congrats guys. i'm all about the decentralized me…. but not when i have to go to 25 different places to find out what people are saying (commenting) about the decentralized me. now i don't have to 🙂 Nice! I agree with this. It would greatly help context if the conversations were separated. Until we can truly get a two way synch on both FriendFeed and your blog, the conversation doesn't make sense without proper threading. Thanks Jirel. We're aware of the email inconsistencies and are currently addressing this issues. We've applied a temporary fix the issue and are currently working on a permanent solution. I apologize for the inconvenience. Thanks Shey. We're working on it. Thanks Bwana. It's awesome! I'm chatting it over with the crew to see if we can make it happen. I'll let you know. You have REALLY great service. Please, take to docs about spammers fight. OT It seems I have to join intensedebate to unsubscribe from mailings from this site. That strikes me as less than logical. Sorry for the trouble. Did you receive an error email notification? Please try adding !END to the end of your replies to ensure that they go through. I use Friendfeed,thanks your job! Hello. I am trying to use the IntendeDebate to collect up all the communication in my professional, not private life. I have a room on Friendfeed. And I would like to link the IntenseDebate account with the Friendfeed room — not user. Is it possible? And how? I'm still quite worried about detaching my comments from my blog as the two are (obviously) intrinsically linked. I'd be happier if there was more in the way of migration options… both for backing out later (eg pushing comments back into the underlying blogging platform as well so as the commenting system can be removed without incident, or using the underlying blogging platform for comment storage and intensedebate for metadata like threading, votes, etc.) and for migrating between commenting systems (eg Disqus <-> intensedebate). Great post!! Since long I was looking for such type of post.Information provided in the post is true and knowledge providing. Yeah, I have to comment on that too- what was with the wall? I personally love the idea as blogging as community building…. From the blogger perspective, using gravatars enhances the sense of community…. It turns comments into statement by real people… It enhances the sense of real community at the blog..
(rita.wilton1@yahoo.com ) I pass through your profile that speaks well about you,,I am looking to have long term relationship that will lead to marriage. My email (rita.wilton1@yahoo.com).please daer dont forgate to send me an email to my private mail box so that i will tell you more about me. I'm beginning to like Intense Debate more and more! Is there a way to automatically email a commenter of a reply to their comment without them signing up for email notification? Sorry for the delay. If they create an IntenseDebate account they will automatically receive email notifications for replies. Unfortunately we do not offer a way to configure this to happen automatically for guest commenters. This is something that they have to opt-in for.